11 Feb 2019 --- Sabinsa’s Shagandha Ashwagandha Root Extract 2.5 percent from Withania somnifera has been found to comply with the US Pharmacopoeia-National Formulary (USP-NF) monograph, confirming its authenticity. The company chose botanical specialist Alkemist Labs to test the ingredient. Ashwagandha’s growing popularity makes caution in sourcing crucial to guard against the adulteration that often follows rapid growth in demand for a herb, according to Sabinsa Founder Dr. Muhammed Majeed. “Ensuring identity of the material and that it will meet our specification claims fit with our commitment to combat adulteration in the supply chain while assuring customers we provide quality ingredients,” Majeed adds. 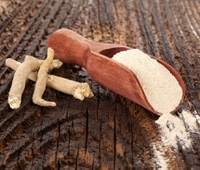 The quantitative testing for Withanolides – compounds within ashwagandha – by HPLC was performed to show the amount of withanolides in the Shagandha extract. This testing was to show that Sabinsa meets its 2.5 percent withanolide specification claimed on the product, according to Sudberg. “In both testing cases, US Pharmacopeia (USP) methods were used. Essentially, the test showed Sabinsa’s Shagandha extract is authentic ashwagandha,” Sudberg adds. Ashwagandha, also known as winter cherry or Indian ginseng, is an Ayurvedic herb traditionally used to counter the reactions of stress by reducing the amount of cortisol released in the body. The herb, which has been used for centuries, is experiencing worldwide growth thanks to a growing body of clinical evidence. The adaptogen has also been proven to regenerate damaged brain cells. Innova Market Insights data show a 48 percent increase in the number of ashwagandha food and beverage global launches in 2018 compared to 2015, with the US taking the lead. In fact, the market researcher reports that the number of food & beverage launches reported in the US is three times higher than those reported in India (2015 to 2018), ashwagandha’s country of origin. Its growth is especially strong in the sports industry. According to the market researcher’s data, one in three product launches featuring the ingredient fall in the nutritional sports category globally between 2015 and 2018. A further two in five launches featured an energy or alertness claim. Consumer awareness of ashwagandha’s wide range of health benefits is growing as clinical substantiation increases and NPD thrives. For example, former Mayo Clinic neuroscientist Daryl Rhys Jones recently developed and launched “Sophrosyne,” a brain-health supplement derived from the combination of four nootropic ingredients – ashwagandha, curcumin, bacopa monieri and hericium erinaceus. Jones and his team evaluated hundreds of ingredients that help the development and function of the nervous system, including the brain. The four most effective ingredients they found, based on their memory and cognition-building properties, were used in formulating the supplement.